The rock legend on social media released a video of the Pyramids and palm trees swaying in the wind on a sand-colored background set to snippet of ambient music mixed with vehicular traffic. McCartney and his label did not provide further details but speculation immediately grew that he was ready with his next album, which would be his first of new material since 2013. 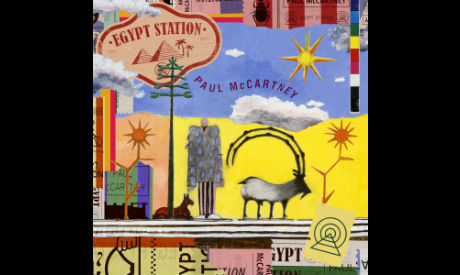 While McCartney is more known for an interest in India than Egypt, a 1999 painting by the musician and artist was entitled "Egypt Station" and depicted sunflowers and animals under a blue sky. McCartney, who toyed with retirement following the end of The Beatles more than 40 years ago, has shown a burst of energy as a septuagenarian and toured the world for much of 2016 and 2017. In an online fan forum during the latest winter holidays, McCartney said he was putting "finishing touches" on a new album that would likely come out in 2018. He earlier revealed that he was working on music with Greg Kurstin, the in-demand Los Angeles producer best known for co-writing Adele's mega-ballad "Hello." Despite his stamina, McCartney told Rolling Stone magazine two years ago that it would be "unimaginable -- and unseemly" to keep performing when he is 80. The now 76-year-old has also said that he has stopped drinking before concerts so as not to forget his lyrics, instead waiting until after the show to imbibe.